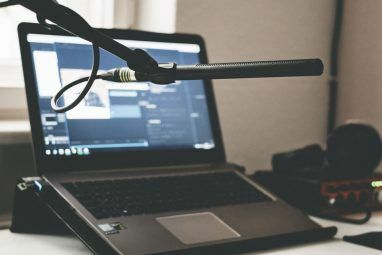 Last week, I talked about how to get started recording a podcast Starting A Podcast: The Best Recording Equipment & Platforms You Should Use Starting A Podcast: The Best Recording Equipment & Platforms You Should Use So you want to start a podcast? Well, hold up there. There's a few things you need to consider first, and though the technical capabilities of modern computers should make this kind of stuff super-easy,... Read More – microphones, Skype or Google Plus and how to record either. This week, I’ll be looking at how to edit your (audio) podcast in Garageband. Garageband is free with most Macs, and it’s an incredibly capable audio editor with everything a podcaster could need. 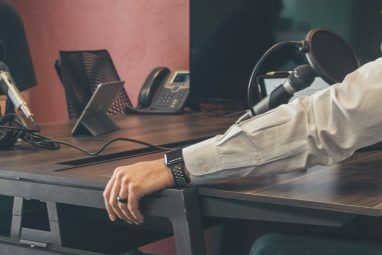 Create a new podcast project – this will give you a special podcast track that’ll we use later. You’re given a few other tracks to start with, but set up how many you need now. I usually add another few vocal tracks, as well as another effects track in addition to the Jingles track provided. ALT-CMD-N is the shortcut key to add new tracks. Choose real instrument when asked. You’ll notice that by default, your vocals tracks have a small yellow triangle pointing up, whilst the Jingles track has a blue one pointing down. These are automated volume adjustments, meaning that your Jingles will be automatically faded out when someone is talking. For a simple podcast, feel free to keep it on these settings, but personally I like to have more fine control over each track’s volume, so I can deal with situations like Dave screaming into the microphone. To deactivated this automated volume stuff, just click the little triangles until they’re all off, then toggle down the larger triangle to the far right of the track details. Enable the track volume, and you’ll now see a light blue line on your composition. That indicates the track level. Find your audio source files and drag them onto the appropriate tracks. It takes a while for Garageband to scan them, and you may not see actual waveforms of voices yet, but they will appear at some point. Most editing can be done with the mouse, just dragging things back and forth. If you need to split a track into two pieces, move the time marker to the correct position, highlight the tracks you want to split (you can CMD click as with any file operations), then hit CMD-T to split them. CMD-A will highlight everything, useful if you just want to shift it all along a few seconds to make way for an intro jingle. Fading the volume or cutting something out completely is easy using the blue volume track you should see. For global volume adjustments on that track you can use the slider, but for fine control click on the blue volume line to add a new adjustment point. Add at least three more, then drag around the middle two. You should see how easy it is to create either a slow fadeout, or an immediate volume drop for sharper cuts. One thing to note is that if you try to move the tracks at this point, the volume adjustments you made will remain in place and your volume edits will be ruined. To avoid this, be sure to enable Lock Automation Curves to Regions from the Control menu – now your volume adjustment track should move in accordance. 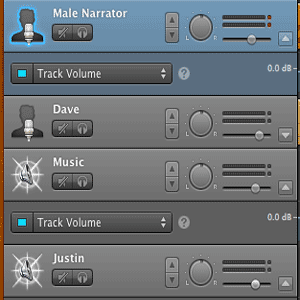 If you notice, some of the default tracks are automatically given a male voice and female voice settings. If it isn’t already open, click on a track, then select the track information from the small i icon in the bottom right. From the podcasting or vocals section, you can choose a variety of preset effects to apply to your track. Play around with some different settings and see which you like best – or you can simply choose no effects. For jingles and sound effects, there are hundreds included with Garageband which you are completely free to use in your projects however you like. Access them from the loops button that looks like a roller coaster, also in the bottom right. Use the browser to find the sounds you want, double click to play them, or just drag them onto a jingles track. I’m pretty sure you’ll lose an hour of your life at this point, as you find all the hundreds of amusing sounds and try to figure where you could slot them in – “I just know that Brontosaurus Wail would be perfect here!” – but don’t overdo it! Used appropriately, they can really add something to a podcast, but overdo it and you’re just going to look amateur. If you started with an official podcast project template, you’ll notice you have a special podcast track at the top of the screen. This is to add track artwork, links and chapter markers, which can be embedded into AAC files destined for iTunes. If a user listens to your track on their iTunes, iPhone, iPod, or whatever – they’ll see the artwork, as well as being able to click on any embedded links. Drag a picture file on there now, then click on it. The details display at the bottom will change to chapter editing mode. Just click in the relevant sections to create chapter titles (which will automatically label it as a chapter), or just add some URLs to make the artwork clickable. Later, as the topic changes, you can simply drag another picture onto the podcast track, and add more details. Before you can upload your completed file anywhere, you’ll need to let Garageband mix everything down. Choose your output settings from Share -> Export Podcast to Disk. Choose AAC Encoder if you want to keep the special podcast track and artwork you lovingly embedded, but you may also want to make a simple mp3 version as well for playing on your website. For the audio settings when you export, 64KBs is fine for predominantly spoken material, but if you’re showcasing musical work you may want to keep it at 128KBs – though this will of course be double the size. Do you have any more great Garageband editing tips? Feel free to add them, please, I’d love to learn some new shortcuts. 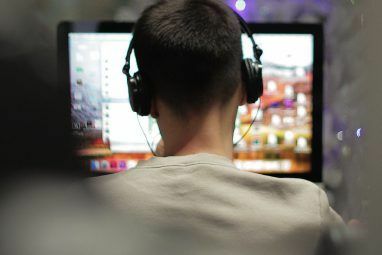 We also have a complete Garageband guide for download How to Use GarageBand: A Step-By-Step Guide How to Use GarageBand: A Step-By-Step Guide GarageBand is a powerful audio recording and editing software for Mac, but getting started is tough. This tutorial will show you how to use GarageBand. Read More , covering all aspects of the amazing app and not just podcasting, so be sure to check that out too. Explore more about: Audio Editor, GarageBand, Podcasts. One problem I've always had with GarageBand is in editing out bits of a voice track - the ums, ahs, gaffes, flubs and mouth noises. I found it so frustrating I went back to Audacity. I don't - like I said, I went back to Audacity. I assume that in GarageBand you'd probably need to split the track at the beginning of the bit you want to cut out, split it again at the end, delete the middle bit and drag the two ends together. In Audacity, you highlight the bit you want to cut and press Delete. Is it OK to say I found it pretty aoewsme to hear you talking and explaining everything which you've touched upon on this blog? We've all read your posts, but it's something else to hear you say it -in terms of you talk about building your career - and I just found it really lovely. Warning all, if on 3G, download each uapdte individually checking the size unfortunately you can't even be *that* cautious because the app store on iOS devices doesn't tell you how big the uapdtes are so it's a bit of russian roullette. Guess the advice would be to just not try to uapdte anything you couldn't bear to be without in case this happens. Is the iPad version the same as the one on the Mac OS? No, I don't believe so, but I dont own it personally.